An invaluable resource for students and scholars concerned with the role of the public sphere beyond the nation-state, this book will also be welcomed by anyone interested in globalization and democracy today. Nancy Fraser is Henry A. and Louise Loeb Professor of Political and Social Science and Department Chair at the New School for Social Research. Kate Nash is Joint Director of the Centre for the Study of Global Media and Democracy at Goldsmiths, University of London, and a Fellow of the Center for Cultural Sociology at Yale University. 2. 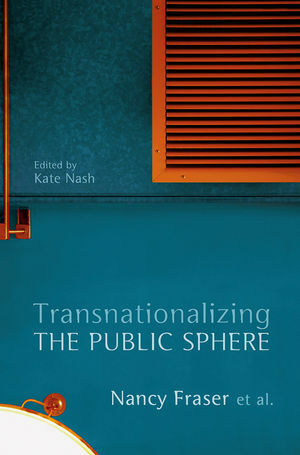 Kate Nash - Towards Transnational Democratization? 4. Nick Couldry - What and Where is the Transnationalized Public Sphere? "For all those interested in the difficult but urgent question of how to decouple the public sphere from its national limitations, the critical debate represented in this book is by far the best starting-point. Anyone who reads the whole debate will undergo a true learning process - a judgement that can be made about very few books!" "Nancy Fraser has long been one of the most original voices in interdisciplinary social and political theory. Here she brings new perspectives to the basic question of whether democracy and public engagement can be effective beyond the increasingly problematic containers of nation-states."